The occurrence of an additional layer, called F3 layer, in the equatorial ionosphere at American, Indian, and Australian longitudes during the super double geomagnetic storm of 7–11 November 2004 is presented using observations and modeling. The observations show the occurrence, reoccurrence, and quick ascent to the topside ionosphere of unusually strong F3 layer in Australian longitude during the first super storm (8 November) and in Indian longitude during the second super storm (10 November), all with large reductions in peak electron density (Nmax) and total electron content (GPS-TEC). The unusual F3 layers can arise mainly from unusually strong fluctuations in the daytime vertical E × B drift as indicated by the observations and modeling in American longitude. The strongest upward E × B drift (or eastward prompt penetration electric field, PPEF) ever recorded (at Jicamarca) produces unusually strong F3 layer in the afternoon hours (≈1400–1600 LT) of PPEF, with large reductions in Nmax and TEC; the layer also reappears in the following evening (≈1700–1800 LT) owing to an unusually large downward drift. At night, when the drift is unusually upward and strong, the F region splits into two layers. Balan, N., H. Alleyne, S. V. Thampi, K. Lynn, Y. Otsuka, B. G. Fejer, and M. A. Abdu, F3 layer during penetration electric field, J. Geophys. 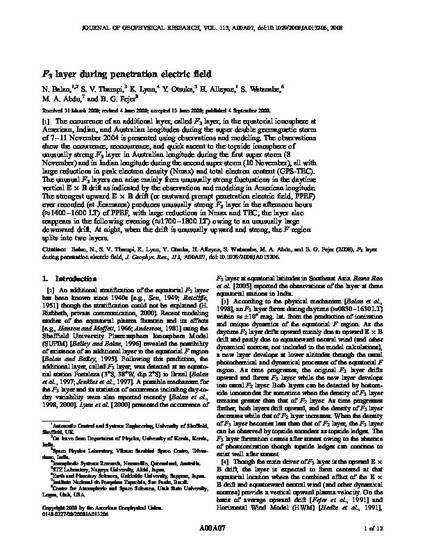 Res., 113, A00A07, doi:10.1029/2008JA013206, 2008.